NativeHQ and Nico Translation are beginning a large project called WordPress i Bawb (WordPress for Everyone) in which we will release useful components of the WordPress content management system in the Welsh language over several months. Although the main WordPress system has been available in Welsh for many years (thanks to Rhos Prys, Iwan Standley and others) there remain swathes of good plugins and themes which are not. There are hundreds of such plugins and themes for WordPress, authored by professionals around the world. Our main question is, which ones are the most useful for website managers who wish to provide content and services in Welsh? Obviously we have a good idea of what we’d like to see from our experience of building and running websites and of training people in how to use them. But now we are giving the opportunity for you to influence our decisions and suggest plugins and themes for the final list. We are asking publicly in order to learn, and help others learn, about useful WordPress functionality. Do you run, or are you looking to run, a Welsh-language or multilingual website in one of these categories? Which plugins and themes would you like to see translated into Welsh? Why? Please leave a comment below. If you really don’t want to comment, you can email carl@nativehq.com instead. All work will be released under the GPL licence to support and encourage freedom of re-use. There is the potential that wordpress.com and other blogging services will use our translations too. Please note that we cannot promise to accept your suggestions. This work is supported by a grant from Welsh Government’s Welsh Language Technology and Digital Media Fund. 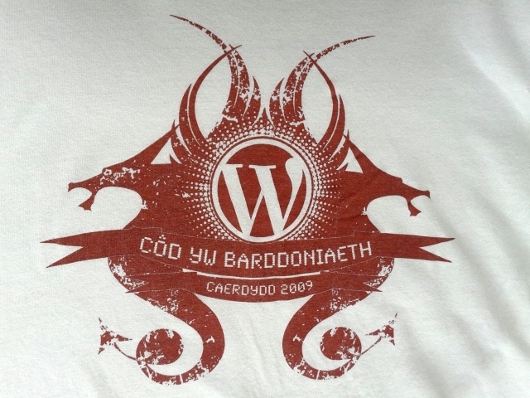 The above photo is of the WordCamp Cardiff 2009 t-shirt. Advanced Custom Fields http://wordpress.org/plugins/advanced-custom-fields/ should be on the list, it’s a great plugin that really opens up the possibilities of what can be achieved with WordPress. I’d also consider the JetPack suite by Automattic http://wordpress.org/plugins/jetpack/ there’s a lot in there to jumpstart new sites.